The children are certainly enjoying the warm weather. It’s hard to believe the school year is winding down. We are looking forward to our summer program starting in a few weeks! The children are having a wonderful time exploring the Creativity Room. We would all like to thank Miss Vickie for a wonderful year in the Science Room and for nurturing our students through their discovery of science. The older children right now are enjoying the Golden Bead materials and working on adding and multiplying. The older children who are working on piano lessons are eagerly panning a piano recital so that their parents will get to hear them play. And of course, everyone is eagerly looking forward to warmer weather after such a long, cold winter! 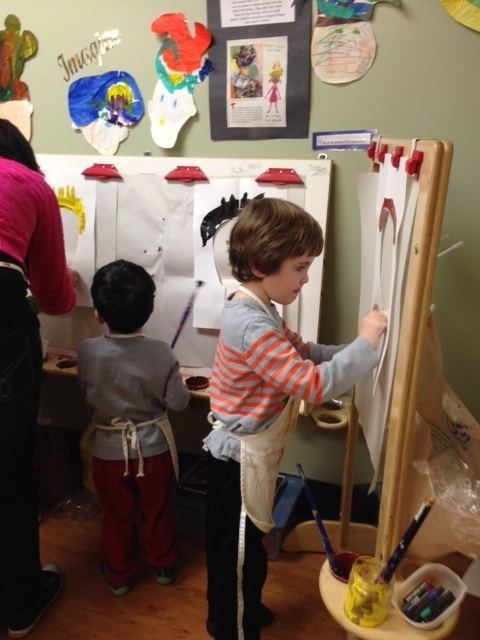 Despite the chill of the polar vortex outside, we have been having a lot of fun exploring new activities inside. The children have been exploring dinosaurs, which is always one of the most popular work areas. The younger children always enjoy learning the names of different dinosaurs and the older children have been combining reading and writing to craft sentences about them. Another new work area explores the culture of the North American continent. We were also happy to celebrate a half birthday – children with summer birthdays get the opportunity to celebrate their half birthday with their friends at school. During our birthday celebrations a candle is placed in the middle of the floor to represent the sun. And the child walks around the candle, one complete circle for each year. The child also gets to share a personal photo to represent each year. This is a wonderful chance to celebrate growing up. We are definitely hoping for some warmer weather next week! It is wonderful to be back in the classroom after our winter break. With the arctic weather outside the children are certainly enjoying the indoor playground this week! The past two weeks we have been busy exploring the harvest theme. The children enjoyed pumpkin pounding and jack-o-lantern carving. There was a delightful display of costumes, sharing, and enjoyment at the harvest party. The children have been working with our new Spanish teacher, Miss Abby. She comes to us from BGSU as a student teacher. The children are being immersed in Spanish as Miss Abby speaks conversationally with the children as she introduces new concepts. Miss Jennifer works along with her and has been given the opportunity to revisit her Spanish experience as she helps to guide the children’s conduct. Miss Abby has introduced personal greetings, colors, and numbers. We are continuing to build a strong community of love and concern. We welcomed back one of our members who just returned from visiting Korea. He shared a traditional Korean treat that his family serves at a holiday, much like our Thanksgiving. We said good-bye to 24 butterflies that the children released after having the opportunity to watch them transform from caterpillar, to chrysalis and then to butterflies. The children unanimously voted to release them to the beautiful garden off of our outdoor playground. We demonstrated the activities of rough and smooth from the Sensorial area. A child talked about how he noticed rough and smooth in a movie. The children then decided to go home and find rough and smooth objects and surfaces in their home. Week four went wonderfully! The children learned the difference between living and non-living. They labeled items inside the classroom, and in the garden off the creative room.